Our Lady of Vilnius rectory cat, Jellybean, passed away on Friday, November 18, 2011 with former parish trustee, Joy McAleer by his side. "Last but not least is the parish cat Jellybean who deigns us with his presence in the hall on special occasions." They say that "even a cat can look at a king." Apparently Jellybean once had the opportunity to gaze upon a prince of the Church. According to parish lore, which may be apocryphal, Cardinal Egan once visited the parish and casually remarked that Jellybean was overweight. The parish cat wisely kept his own counsel. While serving the parish, Jellybean was cordial but not intrusive, his presence offering comfort to those who arrived at the rectory in distress. When the rectory closed Jellybean retired from public life, enjoying a regimen of chilled water, cat grass, wet and dry cat food, naps on a sun-dappled carpet and the gentle companionship of Ms. McAleer. Lest his reputation be unnecessarily tarnished, I will make it clear that Jellybean was not the orange cat who, tail aloft, attempted to participate in the liturgy via dramatic entrances from the sacristy or center aisle. These were the antics of a different cat named "Morka." Jellybean occasionally expressed some envy of another orange cat, Chico, who made his way to publication as Pope Benedict XVI's biographer. Jellybean hoped to attract a literary agent who could propel his writings into print. While this did not happen during his lifetime, his admirers will certainly catalog and edit his literary legacy and make every effort to make it available to the public. Jellybean is survived by many parishioners whose lives he touched. While we do not have a list of his progeny, we assume they exist based on accounts of missed rectory curfews. We hope that they are numerous and touch as many lives as Jellybean. 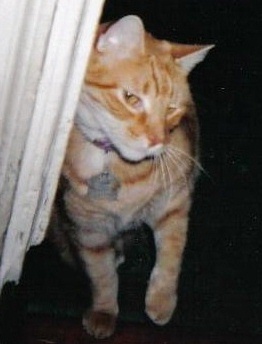 Jellybean lives on in his namesake - another orange cat who was named after him. This little Jellybean is eight years old and never goes out - he spends his days watching the mourning doves and pigeons in the alleys and airshafts.